You should know that I’m in Latrobe PA leading a TDAA judges clinic. One of the most painful difficult tasks I’m faced with is getting very novice course designers a push in the right direction. 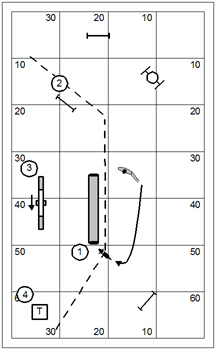 Mind you, there is reference material out in the world for this sort of learning… like Stuart Mah’s Fundamentals of Course Design for Dog Agility. But you should know that, if you’ve never gone through it, the learning curve for course design can be nearly overwhelming at first. I’m going to suggest a possible approach to course design that mightn’t have occurred to uncle Stu. What if the designer was to run across a really nice little course out in the world… and just steal the darned thing for his own? Allow me to suggest how to approach such a project. Think of it as reengineering or “black boxing”… kind of the way the Chinese appropriate American technology. If you steal from one author, it’s plagiarism; if you steal from two, it’s research. I really like this course that I discovered on a browsing tour of the internet. It has really nice flow right from the beginning. On the dismount of the dogwalk there’s a little technical bit over jump #11 and a frankly tough approach to the weave poles. And then it opens up again with probably the most technical bit being the discrimination on the approach to the pipe tunnel at #18. Okay, we’re going to borrow this course. Let’s get the obvious stuff out of the way first. This is apparently a course designed in Europe; because it’s laid out on a 5m grid, and the course ID stuff in the text box doesn’t resemble American English. Select the text box, and hit the delete key. We don’t know what any of that stuff means anyhow. And just to have a little fun with it… let’s mirror the course right to left (In CRCD select Edit and select Mirror Course Horizontally). The course certainly looks different. Be honest though, this course still belongs to Sr. Baretta. There might be a couple simple tweaks the designer could make. 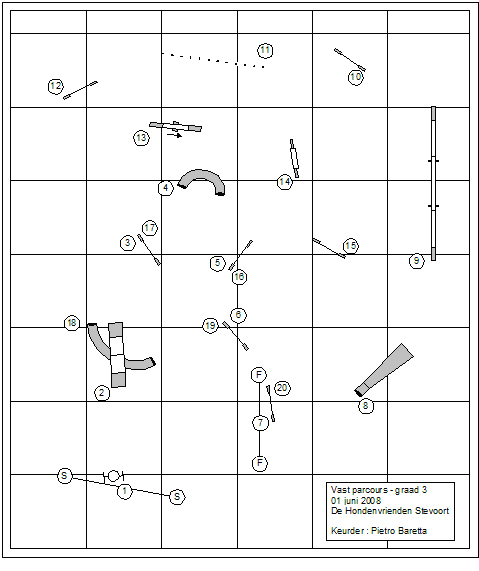 For example we could put the #4 on the opposite side of the tunnel (American course designers after all loathe giving the dog the flowing entry into the pipe tunnel; lord save us from releasing the dog to work). 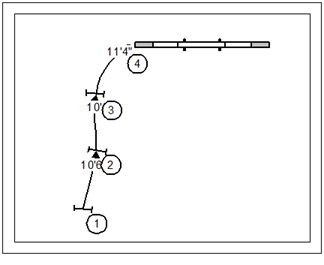 And, we could put the table at #10… although that would lose us that interesting jump/weave pole transition. Also… we might put the course on its side. Um, does this course still belongs to Sr. Baretta? At this point the course designer should consider making some changes to the course that make the course something new and different… something that Sr. Baretta did not contemplate. The sequencing in this course has been dramatically altered, and without losing some of the really interesting stuff. From the A-frame the sequence into the pipe tunnel is something altogether new. Note however that this raises the obstacle count; and so farther down in the course we’ll have to reduce the obstacle count. The sequence from the dogwalk through jump #17 has been changed completely. In the transition from the weave poles to the newly positioned table we’ve introduced a dummy jump. Also jump #17 has been pressed in to provide more of an option to the dog in the transition from jump #4 to #5. And, we’ve turned the dog out to a new finishing jump. The tandem presentation of jump #20 and the collapsed tunnel at #11 is a challenge posed to the dog as an option two times. Oh, and I changed the length of the pipe tunnel under the A-frame. Be mindful that one of our original objectives was to cure a bad case of the blank page and get moving with course design. 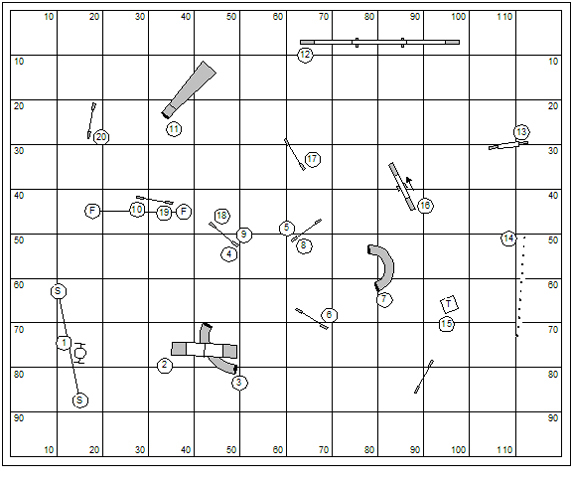 And so we borrowed another course designers set of the field and had our way with it. So you answer the question… have we plagiarized the work of another agility course designer? What if we took another step and reversed the course (ala NADAC)? The hour is late and I really have to admit to something. In my haste to tweak out the last vestiges of Pietro Baretta I’ve ultimately created a course I don’t like very much. So I’m going to go way back to the third drawing presented in this post … and say that is the course I’d really like to finish up with. Italy is a long way away, after all. In course review a comment that I often have to make is that an obstacle must be square to the dog’s approach. In all classes this advice applies to the contact obstacles and to the tire. In the Beginner class we want reasonably square approaches to all obstacles. I’ll limit discussion on this topic (today) to a square presentation of the dogwalk. The dogwalk is often a feature of one side of the ring or another. And so in course design we have, often enough, an ostensible right angle transition from a jumping sequence to the dogwalk. The sequence I show in this drawing will get a MUST FIX notation in my course review as the approach to the dogwalk is not square, and not safe. Don’t get me wrong here. Maybe only one dog in five or ten will approach the dogwalk with such reckless speed that attempting to corner on the ramp causes them to dump off the side. For our purposes it is not the dog’s job to approach the ramp in a square and safe manner; and it’s not even the handler’s job. I admit that it’s an interesting riddle “can you do this without harming your dog?” … but it is not an appropriate riddle, at any level. It is the course designer’s job to provide reasonable assurance that the ramp is square and safe to the dog’s approach. I can’t really provide a fancy mathematical formula for presenting the dogwalk square to the dog out of a turn. I have a simple rule-of-thumb with two parts: 1) provide an appropriate turning radius for the dog; 2) provide sufficient real estate to accomplish the turn. Here’s an adequate illustration of my two part method. First of all I assume (in the TDAA) a roughly average turning pivot point on a 90° turn of about 5 feet. Jump #3 in this drawing measures precisely 5′ from the red line. I also provided a minimum of 12′ for the dog to accomplish the turn. You’ll note that the line was drawn automatically by CRCD which doesn’t have the good sense to understand that a dog doesn’t actually turn in the air over a jump. Note, by the way, that I corrected the transitional distances between the jumps in the opening line. 8′ is precisely the recommended measurement in a straight line between jumps. That’s another blog topic! We have a game in the Book of Agility Games that we call “Mute Agility” (most likely the invention of Stuart Mah). The basic flaw in the documentation of the game was to establish that there is “no standard course time” … and, failing to establish a qualifying criteria. If you look at the game objectively, it us a simple Time, Plus Faults game. 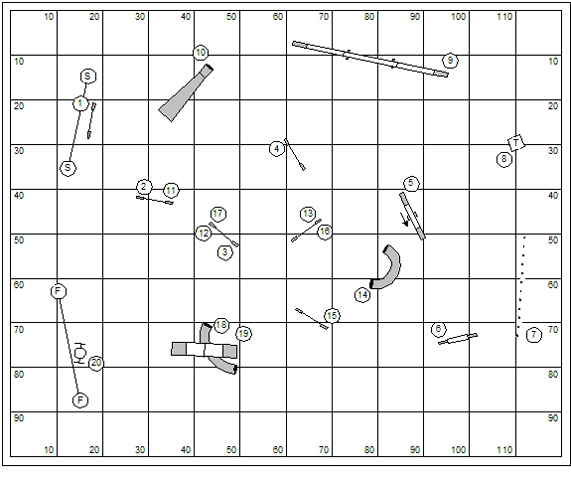 But we can’t sort out the bodies at the scorekeeping table without qualifying criteria; and certainly that calls for a Qualifying Course Time (QCT). As a training exercise or for a real competition, Mute Agility is a wonderful test of the dog and handler relationship and often a lot of fun for spectators. 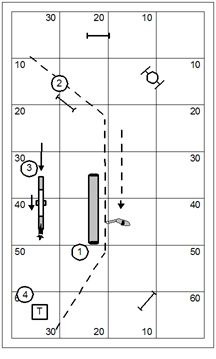 This game is frequently used to show the importance of body position and body movement and how much this influences the dog’s performance of the course. This game is sometimes called Silent Snake. Mute Agility is most likely the invention of Stuart Mah. Mute Agility can be run on any standard agility course. The dog must perform each obstacle on the course in the sequence designated by the judge. 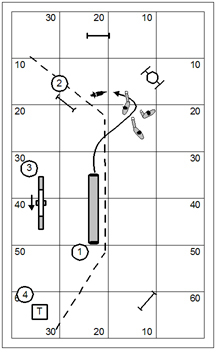 Unlike on a standard agility course, however, the handler must run the entire course silently. No verbal cues are allowed; that means no verbal commands, no clapping, no stomping the ground, no whistling, and so on. Body language must speak for itself. A Qualifying Course Time shall be established by the judge based on the rates of travel used in the Standard classes respective to level and jump height. Scoring is on a Time, Plus Faults basis. The system used for judging faults should be consistent with the game that is being played. Mute Agility adds a fault restriction for speaking. Usually, the judge will assess the handler 5 faults for each word spoken on course. The verbal cue for releasing a dog from the start line is typically exempted from any penalty in this game as it is a good practice for a handler/dog trainer to release from the start line with verbal rather than physical cues. 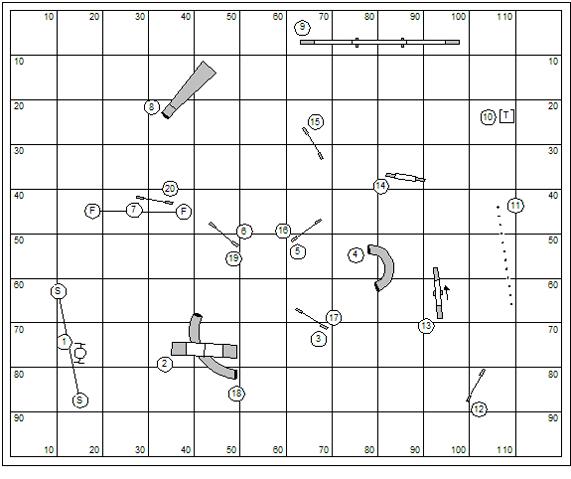 The design of the course should include appropriate challenges for the level of competition. The Mute Agility course should strike a balance between nice flow and basic technical challenges like changes of side, crossing patterns, and changes of direction. 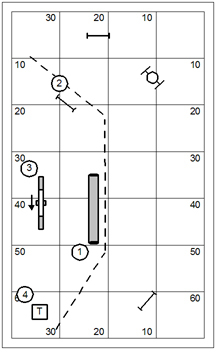 The following course is based loosely on a Mute Agility course designed by TDAA judge Sheryl Lynch. 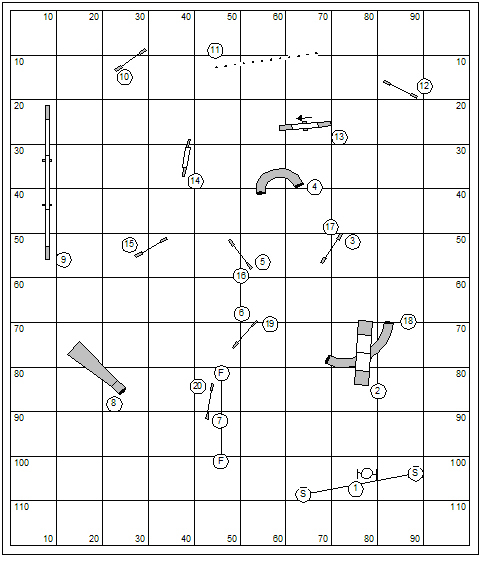 Silent Snake variation – In this variation of the game, created by Sue Tovino and Betty McArthur, the course consists of a constant change of sides or snaking motion. 15 faults are assessed the first time a handler breaks the silence. The second occurrence results in elimination. Single command – In a variation of this game the handler can give one command, which must be declared to the judge before the dog’s run. Thus, for example, a handler may choose tunnel or weave. Ideally, a handler should choose the command that is most necessary to control the dog. A come command might be a good choice. Mute agility games – Almost any agility game can be played in the Mute Agility format. However, this format might not lend itself too well to games like Gamblers, which often rely on the handler’s voice commands to achieve the joker. Monetary penalty – This variation of the game is a good club fundraiser. The handler is penalized $1–$5 for speaking (or whispering!). To qualify the team must score equal to or less than the established course time. Mute Agility is the game of agility with a silent handler; though usually judges will allow a verbal release from the start line. Mute Agility is typically played using a standard course, but really could be played with any agility game. On June 29th, 2012 a derecho swept across the Midwest and intensified precisely as it drew over my property near Marietta, Ohio. This weather system with a name I’ve never heard of before made a mess of my property, knocking down trees and bringing down power lines. Amazingly, None of the structures on the property were damaged. Now, I shared last week a “daily” exercise I intended to work on through the week with Kory because, as I noted, he wasn’t showing a clear understanding of the full height A‑frame for big dogs; (about 5’11-3/4″ in case you were wondering). Rather than training my dog through the week I was busing myself around the property, mostly with a chain-saw working very hard to clear out internal roads. So off we went on the weekend to a USDAA trial in Indianapolis. And here’s how it went… I don’t believe he hit a down contact for the whole weekend. You know, we qualified in Pairs… but that’s a time plus faults game and we qualified in spite of Kory’s missed down contact on the dogwalk. I actually left in some disgust, actually skipping an Advanced Standard class at the end of the day on Sunday. That’s something I never do. I didn’t really see much sense in stepping on the floor to embarrass myself with an untrained dog one more time. This is no commentary on the courses designed by USDAA Masters judge Becky Dean. Her courses were lovely and appropriate; and her judging was professional and spot on. I returned home knowing that something was broken. Here’s a boy who has been doing a 2o2o since he was two months old (albeit on a contact trainer then). And suddenly he has no concept. For the next couple days I took him out to the training building prepared to remind Kory of his job on every contact. And… on every contact… he jumped into a perfect 2o2o. 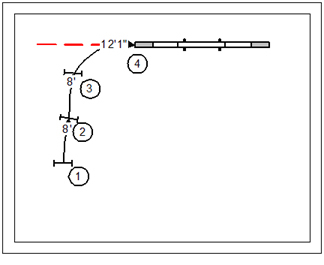 I’m talking multiple reps, on nice flowing sequences, the teeter, the A‑frame, the dogwalk… a perfect 2o2o every time. This evening I took the 36′ dogwalk and put it on the lower field. From the top of the hill I sent him 50 yards running down the hill onto the field to the performance of the dogwalk… and he stopped at the bottom in a perfect 2o2o. There’s an interesting part of a story in James Micheners Hawaii. The pineapple crop on the islands was failing. So the plantation owners roused the horticulturist who had designed the system from his drunken stupor and put him on the problem when he was sober and steady. After a bit he identified some insufficiency in fertilizer. Having solved the problem he returned to his drunken binge until some future time when he might be called on again. You must know that I’m a lazy dog trainer. I’m not real mental about pounding and drilling my dogs. Now I know that something’s wrong with the basic crop… so I need to sober up and fix it. The hardest part of this is for me to understand what I’m seeing. I’m not one to anthropomorphize my dogs. You won’t catch me saying silly crap like “He was just blowing me off.” Slightly congruent to this idea… there might be an argument that Kory is “ring wise” and knows he can get away with it in competition. And so I might have to become one of those fellas who swoop their dogs out of the ring when we fail to get a good 2o2o. Okay, that’s not going to happen either. If you want an explanation, I’ll have to write a whole blog just on that notion. But right now I’m faced with fixing my problem and I don’t have time for a lot of foolishness. To be very honest I’ve felt the encroachment of this problem and did not honestly acknowledge it. It is a problem of stimulation. Kory, when he enters the ring, is over the top. Rather than solving it there (in the ring), I’m going to solve it here. Marsha, the consummate dog trainer, has a devilish scheme to make things so exciting that Kory will be enticed to fail, whereupon I can apply my completely neutral but very clear correction. I can only offer a description of what I would do to solve this distance challenge. Here’s my step-by-step. Arrive cool and collected. This is a thing I always remind myself in a gambler class. The whistle announcing the end of point accumulation and the count-down of the gambler clock should not inspire hurry or panic or dread. I’m thinking that the distance work begins with the presentation of the pipe tunnel. I want to send my dog the length of the tunnel to get it. The reason for this is straight-forward… I want a close proximity to my dog as he comes out of the tunnel. If the handler is racing the dog the length of the tunnel there’s too much that can go wrong with the pressure of movement, particularly if the dog is ahead of the handler. Out of the tunnel I want to draw my dog as though we were going on to the tire. What I’m hoping to convey in the drawing above is the handler doing a Tandem Turn (crossing behind the dog on the flat) to turn away to the #2 jump. Out of the Tandem I have a small bit of real estate to keep pressure out to the teeter. I’ll want to show zero inclination to turn here… just keep my pressure flat and out. Note that I show the handler stepping up to the line that parallels the #1 pipe tunnel. The other line, that parallels jump #2 is a gotchaline, put there to fool the tourists and invites them to step in too far. If you step in, then you have to step out, and that “stepping out” stands a good chance of spoiling the gamble. Well heck, if you’ve made it this far don’t spoil it with a fly-off or a missed contact on the teeter. If you have a running contact stay smooth and parallel out to the side; If you have a 2o2o say your magic word and insist upon it. The course designer relents a bit with the containment line on the dismount of the teeter. The line encroaches on the table and allows the handler to give pressure of movement to give the dog good focus to the last obstacle. Note that I’ve banked my whole success in the distance challenge on the Tandem Turn from the pipe tunnel to jump #2. I’m thinking that a lot of people will run forward to try to make this send with a Front Cross which will have the handler all flat footed and easily committed over the gotcha/tourist line. I’m completely aware that the #2 jump is a blind/managed approach which seems to be the god-awful fad and plague of our day. This is a handling challenge that demands micro-management. 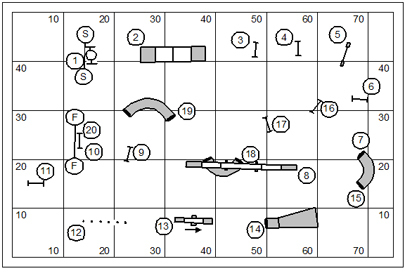 I’d be completely happy in life if both numbered courses and the routine distance challenge were sequences in which one could release the dog to work. But, we have to play in the real world. Yes, the power is still out at my place. And we are living a grim existence. I dragged the Homelite 4400 Watt generator out of the tractor shed and by some freak of luck the thing actually works. I didn’t even have to replace the spark plug. Two gallons of gas make it roar (very loudly) for about 12 hours. It hasn’t been doing any grand duty. We run a fan, a small refrigerator, phone & internet, a television and a dvd player. I expect it could run a lot more. I’d be reluctant to try to run the house with it; even if I knew how to feed the electricity from the generator to it. We have two poles down on our property (between the road and the meter… an important distinction). Yesterday the electric crews were here cutting down trees in the right-of-way. They didn’t show up today. I reckon it could be another week. I can hear the generators running down in Watertown. The coop guys will probably attend to me after getting electric back into town. I spent today clearing the roadway down by the lower cabin. I have a little 16″ Poulan chain saw. In the roadway is a very big oak tree and a pretty big white pine which toppled over together only just avoiding smashing through the roof of the cabin. I worked like eight hours on the project today and after stacking several tons of bramble and stacking new firewood… I reckon I’m only about half done just opening the roadway enough for a vehicle to have passage. Chain-sawing a downed tree is a science to which I had crash-course schooling today. At one point my chain-saw was pinched and held by a 6″ branch. I had to go fetch an axe to cut through the branch and relieve the pressure and have my chainsaw back. In case you were wondering, the 2-cycle oil mix for the Poulan is 40:1. Also the blade lubricant gets used up at nearly the same rate as a full tank of gas. Always wear gloves. Don’t stack the pine with the oak. Needles to say, I’m behind on a bunch of my other obligations. Tomorrow I’ll be on the road about noon to take off for Indianapolis and a USDAA trial there. I’m really looking forward to an air-conditioned room at the La Quinta. Marsha, I believe, will be heading in to stay a few days with her mother. She doesn’t trust herself to be at the mercy of the temperamental generator. I’m sitting outside as I write this. We’ve turned off the generator for the day. I’m getting a relatively cool breeze. But I can’t sleep out here and will go back in soon to sweat through another night in the basement (where it is cooler than up stairs). I’m on battery… so I’ll have to hurry to get this posted. It was a very interesting trip for me to New York. It was very fun working with this community of USDAA enthusiasts. While I was away my home was slammed by fierce winds that knocked down hundreds of trees on our property. We are without electricity even after I’ve returned. I might spend a minute elaborating on our many dependencies on devices that are powered by electricity. For now I’ll allow you to use your imagination. Believe it or not, I sat down to read a book since I felt myself deprived of every other conceivable recreation. The book is My Antonia by Willa Cather. I’ll be danged if I wasn’t a full paragraph into the book before I had to drag out my dictionary and look up a word (catafalque). You know, I read that book something like 30 years ago. You’d think I wouldn’t have to look up the words, anymore. I’d better hurry write & publish this. My battery is only good for about 3 hours. I’m reminded that the designer of the gambler’s riddle doesn’t really have to get mean or tricky. What might seem a gimme can be perfectly and appropriately challenging to the field. While this gamble yielded qualifiers at every jump height (and in PIII and Vets) it was anything but a gimme. It wasn’t too long ago that I wrote that people will fail to direct their dogs in a pinwheel because they don’t understand what direction to face. The handler is conditioned to turn to face as though he’s moving parallel with his dog even when he is not moving. 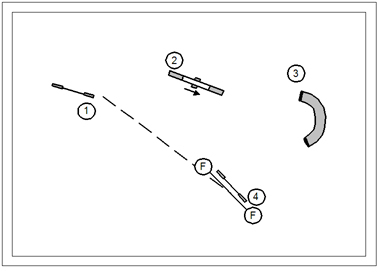 For example, after getting the dog over jump #1 the handler will turn to face jump #4. So a fair number of handlers failed simply because they would not so much as face the approach to the teeter. Very subtly in this distance challenge the containment line is set at an increasing oblique. On the dismount of the teeter the handler should be able to apply a bit of pressure of movement to keep the dog out to the left side of the pipe tunnel. This distance challenge demands that the handler reserve a bit of real estate to have room to take a step or two and apply that pressure. … buys an electric chainsaw? You are currently browsing the Bud Houston's Blog blog archives for July, 2012.